I'd bet just about all of us in the AFOL community, at some point, have heard someone say that we "still play with LEGOs." Okay, fine, I build spaceships, yes. And occasionally swoosh them around the house. It may be a 120 studs long with over 12K pieces, but it's still a spaceship. Now, Didier Burtin has created a modern artistic piece that may silence those snarky comments. 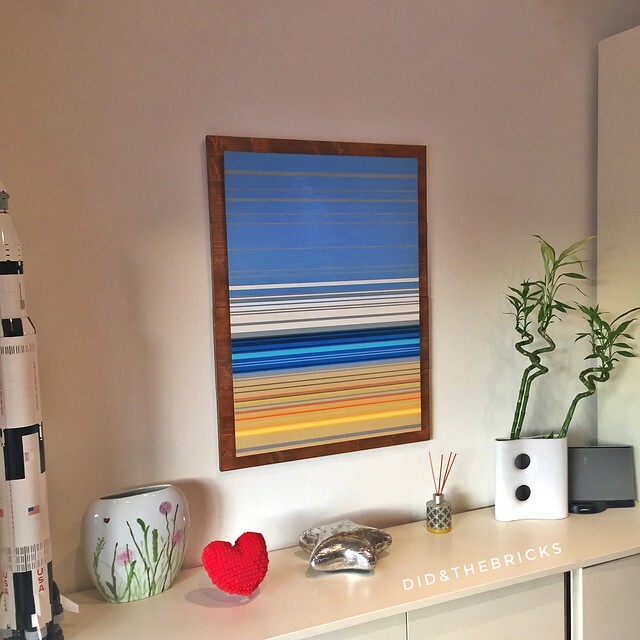 A wall mounted, wood backed, studs up rendering of an ocean view. Using only lines of color, it's very effective, and looks quite impressive as a center piece over what appears to be a living room console. So stunning, in fact, you may not have noticed his Saturn V Rocket over there on the left. Zoom! LEGO, Art, decoration, beach, Shark!